We love art for what it provides: the feeling of pleasure, nostalgia of memory, freedom of escape, and exhilaration of discovery. We wish to share with the world the works of artists that convey a vision of the world that may be reinterpreted and personalized at the most intimate level by each and every observer. 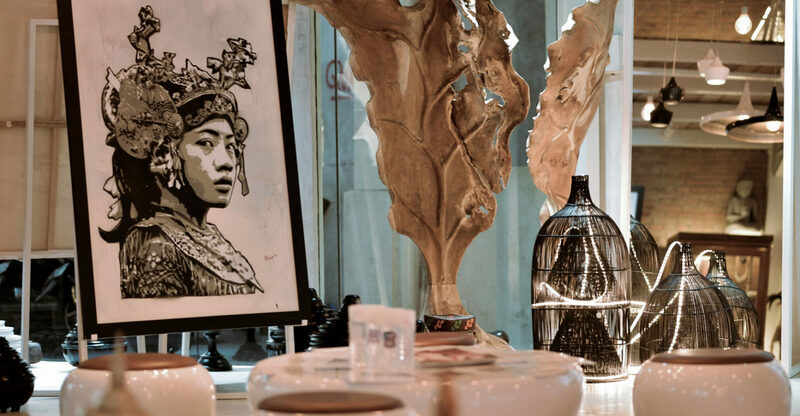 Representing ten Indonesian and international artists, Nyaman Gallery is an embodiment of beauty in the world of diversity, inspired by the magical life of the island of Bali. Holding on to the concept of “Nyaman”, which translates to ‘cozy’ or ‘comfortable in the Indonesian language, we strive to practice the philosophy of our name. More than a word, “nyaman” captures the spirit of both the refinement and intimacy of home. Representing all things that are genuine and authentic. Following the critical and commercial success of our partnership with Nyaman Villas and Nyaman Boutique, we diversified our creative and entrepreneurial palette to open Nyaman Gallery. Our curator has spent many years living in and loving the art of Saint-Tropez, New York and Paris. By mingling artists and mixing styles, we promote the Bali-based contemporary artists with equal fervor. We spot the overlooked talents and ensure that the world starts to take notice. At Nyaman Gallery, we would like to give back to the island of Bali by presenting creativity in an innovative way, to inspire, and continue sharing our passion for art with artists and those who support them. To us, artworks are lenses created by artists to connect our world to theirs. By working closely with our artists, we make sure to nurture their creativity and follow their journey to be able to complete our roll as the bridge between the creators and the audience.